Minto Monumental Inscriptions is the 24th volume of Roxburghshire Monumental Inscriptions to be published by us. The parish of Minto lies to the north of the River Teviot and to the east of Hawick, surrounded by the parishes of Lilliesleaf to the north, Ancrum to the east, Cavers to the south and Wilton to the west. Part of the old parish of Hassendean was transferred to Minto in the 17th century. Monumental (gravestone) inscriptions are listed for the 249 of the 257 gravestones at the Parish Church, together with those in the old churchyard which were recorded by the Hawick Archaeological Society. There are 257 gravestones listed in the volume with colour photographs of all. Names of householders listed in the Hearth Tax of 1694 are included, together with the Militia Lists of 1813 and 1831, which show an interesting mix of occupations within the parish, reflecting the demands of a rural community and an estate. 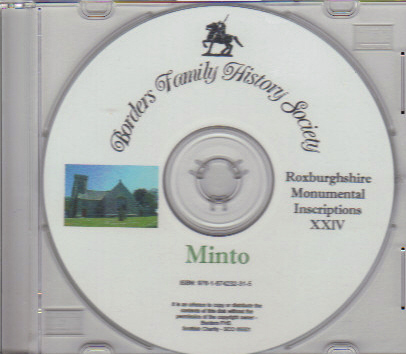 There are lists of ministers of Hassendean and Minto, and photographs of Minto War Memorial together with the inscriptions. Surnames, place names and occupations have been indexed and there are plans of both churchyards showing the location of the stones. Ainslie, Aitchison, Aitken, Aitkin, Anderson, Armstrong, Bain, Ballantine, Barbour, Baring, Bayne, Beattie, Bell, Berry, Biggar, Black, Blackie, Blaikie, Blair, Blake, Blythe, Boa, Borthwick, Brack, Briggs, Brokie, Brown, Brunton, Brydon, Buchan, Budgen, Buglass, Bunyan, Burn, Burnet, Burton, Cairns, Campbell, Caskie, Clark, Cockburn, Cook, Cowe, Craig, Cranston, Crawford, Crichton, Dalgleish, Davidson, Davies, Dawson, Deans, Derham, Dickinson, Dickson, Dilnot, Dobson, Dods, Doherty, Donald, Donaldson, Douglas, Drawhill, Dryden, Duguid, Earle, Easton, Eliot, Elliot, Ewart, Fairbairn, Fergusson, Forsyth, Frame, Gage, Galbraith, Galloway, Gardner, Garnet, Gault, Gibson, Glen, Gotterson, Graham, Gray, Greive, Grey, Grieve, Hall, Halliday, Hanbury, Harvey, Heatlie, Helm, Henderson, Hendry, Herkes, Hill, Hislop, Hobbs, Hogg, Hope, Houd, Hughes, Hume, Hymers, Inglis, Irvine, Jackson, Jardine, Jeffrey, Jewell, Kennedy, Ker, Kerr, Kirkland, Korkis, Lambert, Lambie, Landell, Lang, Lariston, Larner, Lascalles, Lawrie, Lawson, Lillico, Livingstone, Logan, Lowrie, Luke, Macdonald, Mack, Mackie, Mackintosh, Mader, Magson, Matthe, Mauchlen, Maxwell, Mcculloch, Mckenzie, Mckerrow, Mclean, Mcvittie, Melrose, Merchant, Middlemiss, Miller, Minto, Montagu-Douglas-Scott, Montgomery, Murray, Naismith, Newington, Nichol, Norman, Notman, Oliver, Olszowka, Pages, Paterson, Patterson, Peden, Plenderleith, Pollock, Purdie, Ramage, Rennie, Renwick, Rich, Ritchie, Ritson, Robertson, Robson, Romanes, Ross, Routledge, Rutherford, Sanderson, Scott, Selby, Shakespeare, Shanks, Sharp, Shiel, Simson, Skeugh, Smail, Smaill, Smith, Somerville, Spiers, Spindie, Sprott, Steel, Steele, Stenhouse, Stewart, Stirling, Stopford, Strachan, Tait, Taylor, Telfer, Temple, Thomson, Troops, Trotter, Turnbul, Turnbull, Tweedie, Waddell, Wale, Wallis, Ward, Watson, Whitaker, White, Whitelaw, Williamson, Wilson, Witherington, Wood, Wyllie, Young. Search for surnames in which you're interested in our Gravestones Index Search. The CD is priced at £7 (plus postage). To buy a copy, please contact Mary Thomson on the Contacts page using the contact type 'Order for Publications'. Our thanks to all Society members, and friends who assisted in the recording and transcribing.